Welcome back to Day 29 of Freedom from Clutter in 40 Days. We are really cruising through the decluttering now! If you are tired of the burden of clutter in your home then this series is for you. Day by day we are getting rid of the items that weigh us down, slow us down, and get in the way of having time to spend with our families. I’ve discovered a problem as I’ve been decluttering. If the #1 rule to organization is “everything in its place,” then what happens when things don’t have a place? I’ve got a few thoughts on that subject, so I thought I would share them with you today in case you are experiencing the same issues as I am. Thought #1: I must still have too much stuff. During these past 29 days, I have probably gotten rid of over 20 bags of stuff………. probably way over. I’ve lost count and since I like to actually remove items from my house right away before they become clutter, I can’t go back and count. I suppose the number of bags really doesn’t matter though, the point is that I have gotten rid of a lot of stuff! And…..I have got so much more to go. I think I have gotten really good at hiding clutter. Everything just can’t be in its place when I am still in the middle of my giant declutter project. That time will come. It’s just not here yet and I need to be ok with that in the meantime. Thought #2 I just don’t know where its place is yet. Perhaps, I am decluttering to make room for the item. There may actually be a place for the item if I continue to declutter items that I don’t need. My current plan is to move it “closer” to where I think it will eventually end up. I know. I know. That is totally in conflict with the “touch it once” advice out there. What I have decided is that perfectionism is overrated. It only drives me crazy and slows me down from actually achieving the clutter-free home that I want. If I can quickly remove an item and place it closer to where it belongs, I can then return to decluttering and organizing items that I am sure about. This plan is one way that I can overcome my own excuses and keep moving in the right direction. Thought#3: Maybe some of this stuff does not belong to me and other people need to put it in its place. Dealing with other people’s clutter is a subject for another day. I promise it’s coming real soon. Well, there you go. 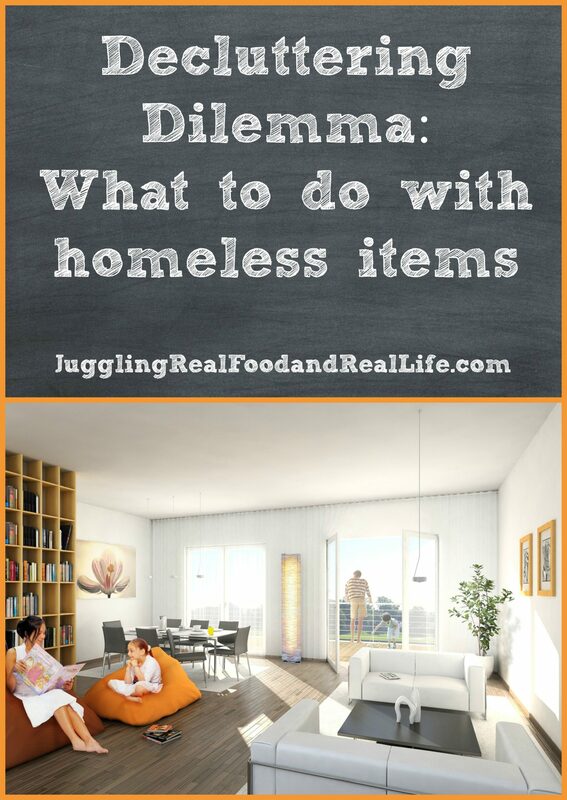 My thoughts on handling homeless items while in the middle of a major declutter project. Obviously, this project is way over-due for me. Four kids and their busy schedules have had a huge impact on my heart and my home. I love to spend time with my family. They are my world. All of that time away from home, has taken a toll on my home’s clutter issues. It’s hard to maintain a clean and organized home when you are constantly on the go. It’s much easier to simply stuff it into a closet. Can I get an Amen? Ok……..Ok………we are done with stuffing things in the closet……..and under the bed. Leave me a comment and let me know how you deal with the homeless items in your home. Do you think there are items that will always be homeless? Let’s get the conversation going so we can really help each other out. Want more? Keep reading for more great tips in the Freedom From Clutter in 40 Days series, by clicking the image below.